The late Les Green, the former Dulwich Hamlet striker played in all three of the Hamlet’s televised matches of the 1940s and 50s. In 2004 he kindly supplied us with this fine piece. I remember this game very well. Quite apart from the fact that it was being televised, generating much excitement and curiosity, it did not prevent a crowd of some 12,000 attending Champion Hill. Two games had already been covered but these had taken place in the immediate post-war years and were in respect of a Cambridge / Oxford University annual fixture and an England / Wales amateur international, you have to accept that television sports coverage was still in its infancy and the BBC was anxious to demonstrate every effort towards making progress in this regard. The club had the largest non-league ground and capacity, and the facilities suited coverage admirably. Quite a fair number of homes already owned small TV sets (6 inch picture) and Champion Hill was the obvious place to start the ball rolling in earnest. One of the features of this particular game was that the club had condescended to have shirts numbered for the first time in its history. Although all of our opponents in the Isthmian League had numbers, there nevertheless remained a strict and sizeable conservative element among committee members who were steadfastly opposed to this innovation. When it was forcibly argued that our programmes already had numbers printed above each player’s name, it became readily apparent that a measure of consistent thinking had to be applied, particularly when the players representing the club would be performing on the box. The change-over was finally conceded but it certainly added fuel to the belief by many outsiders that the club was old-fashioned in its outlook, implying that we honestly considered the adage – “Everybody and everything in football is out of step, except us” to be true when one referred to the Hamlet. The match itself, I seem to recall, was played throughout in persistent drizzle. Eight shared goals must have satisfied viewers. We had a useful side at the time and had just won the Isthsmian League Championship, pipping Wimbledon by goal average the previous May, in the last match of the season. We had a strong squad of players at the club, proved by the fact that our reserves had topped their table also. Leytonstone, our opponents, were already the holders of the Amateur Cup and were previous league champions. They fielded six internationals in their XI. Trevor Bailey, the well known Essex and England cricketer, was in their side and he was also a Cambridge soccer blue who went on to collect an Amateur Cup winner’s medal at Wembley with Walthamstow Avenue some two years later. The previous season we had positively trounced Leytonstone at Champion Hill by six goals to one (Arthur Pheby missed a penalty! ), so this particular fixture for TV coverage had whetted the appetites for supporters and viewers. The high scoring draw was a fitting result. Tim Davies, our outside right. Scored two of the goals. You also have to bear in mind that floodlighting was a thing of the distant future in those days, therefore it necessitated a 2.15pm kick-off. The rain, coupled with cloudy conditions, meant that the final whistle was eventually blown in near darkness. Remember also that it was black and white pictures in those days, which must have frustrated viewing. Oh, and by the way, and on a final note, the numbering of shirts was adopted permanently from then on!! A beautiful sunny afternoon throughout and although a mid-winter fixture, the pitch and conditions were ideal for the TV viewers, much better than the previous occasion. Wimbledon were always tough opponents at any time, and this local derby had been seized upon by the BBC. The matchday programme revealed that the Dons were occupying third place in the table with three games in hand of the current leaders (you’ve guessed it, Leytonstone). Dulwich were lying fourth. 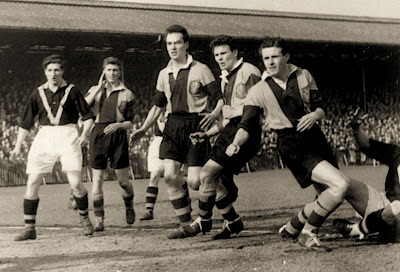 It seemed from around the immediate post-war years right up to the mid-50s that Leytonstone, Walthamstow Avenue, Wimbledon or the Hamlet were always around the top clubs in the Isthmian League at this period of the season. Each club was extremely formidable with some quality players. Oddly enough, and after a settling-in period we scored three times in the first half. These included goals by Doctor Norman Tate, who was working at the local Kings College Hospital as an anaesthetist, and evergreen Tommy Jover. The latter had decided to come out of retirement and his decision, and goal, was truly applauded by the Hamlet fans. Wimbledon replied with a token goal late in the second half, but by then it was all over. The BBC acclaimed the match, facilities and the outcome a huge success. It was most apparent that the quality of football served up was every bit as equal to that displayed by professionals in the 3rd Division (South). 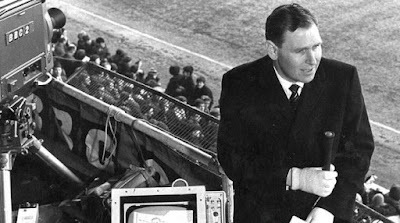 Indeed, in recent times, some fifty years on, when ITV Digital went into administration, was mention made in the national press [David Lacey, The Guardian, 6 April 2002], that the leading senior Amateur sides’ performances witnessed at Champion Hill and other non-league venues in the early 1950s were every bit as comparable, if not better, than current Nationwide Division 2 and 3 matches televised on Friday evenings. The television companies should have seen the light before ploughing in vast amounts of finance. A fortnight after the Wimbledon game the club programme referred to the fact that a viewer from Broadstairs in Kent had originated a telegram, timed at 2.53pm, to the effect, quote: “Reception perfect. Suggest you use the white ball in the second half.” This proved that regular Saturday afternoon televised football was taking off. When this London Senior Cup second round tie was played, the club was going through a bad phase. We were lying fourth from bottom and were accompanied by, among others, Kingstonian, Wimbledon and Romford, who had also acquired strong reputations earlier for displaying quality football. Indeed, Walthamstow Avenue (another member of the Isthmian League) had held the mighty Manchester United (1-1) at Old Trafford in the fourth round of the FA Cup only two years earlier!! Our opponents, Hendon, played in the Athenian League and fielded five internationals in their side, including two, Laurie Topp and Dexter Adams, who went on to captain England sides. They appeared in the Amateur Cup Final at Wembley only three months later, losing to Bishop Auckland by two goals to nil, before a crowd of 100,000 (repeat 100,000). Amateur soccer had taken off and large attendances at Wembley cup finals were the norm. I had been elected captain for this season and must go on record as “the worst skipper in the club’s annals during the twentieth century.” Enforced injury during the early weeks of the season meant that we were continually changing the first eleven but to no avail. The side lacked confidence and direction. I had a complete loss of form to the extent that I sometimes found it difficult doing business for the ‘A’ side. It was a personal relief for me when the season came to an end. Prior to the game itself I was introduced to Kenneth Wolstenholme in the dressing room. He was making a name for himself at the BBC, and within a few years was a household name when ‘Match of the Day’ became a regular Saturday evening feature on the ‘box’. He commentated on the game and was visiting the ground for the first time. Although the match went to extra time, Hendon were generally in command and deserved their victory. It was the same old story – a goal ahead but we were never able to sustain that ascendancy and sew the game up when it mattered. The odd thing about this particular season was that the Reserves won their section very decisively, only losing the last two games of the season. It seemed that we were unable to create a blend for success. A reference to the programme printed on 2 April 1955, revealed that Wimbledon were lying entrenched at the foot of the table, with a month to go. Now there’s a thought! I subsequently learnt that the club received the princely sum of £100 from the BBC for allowing the TV facilities. The match had been played in ideal conditions, sunshine throughout. The Queen’s coronation, 18 months earlier, had meant that more homes possessed a television not only in the Home Counties, but nationwide. The fixture had therefore wider coverage and most viewers appeared satisfied with the product. Yes, football can be a funny game. After such a disastrous 1954-55 season when we finished bottom but one and were obliged to seek re-election to the Isthmian League, only a year later found us appearing in the semi final of the Amateur Cup at Stamford Bridge, 45 minutes from a Wembley final. But that’s another story! Finally, although I appeared in all three televised matches I was never among the goalscorers, which was surprising really, because I used to get my fair share of goals. Perhaps we can put it down to being camera shy! Original article from HH12 Spring 2004.